The most famous and powerful woman of Sunset Valley raised from a spa worker to The Leader of The Free World. Everyone in town knows Dina Caliente, and some people even fear her, but everyone respects her. She was married once, her wife was also famous but Nala’s field of interest had been music. She played for the Sunset Valley Symphony and is also known as a composer. She and Dina adopted two daughters. They split after rumors of Dina having an affair with a convicted criminal Mortimer Goth. The story was never officially confirmed by Dina Caliente and despite the rumors and the subsequent divorce she still managed to win her last election. Dina had recently married her long time fiancee Justine Hook, a young chef who had now moved into Dina’s mansion with her and her daughter Sara. Well into her retirement Dina enjoys parties, clubbing, cooking and working in her garden. You can read more about Dina here. Nina moved to Sunset Valley with one goal in mind. Have fun. That is exactly what Nina had been doing for years. Of course, one also has to pay bills so Nina used her guitar playing talent to earn money. She was very good at it and had recently retired after writing a number of famous movie soundtracks for music studios from Sunset Valley to Bridgeport. Up until recently she was playing, mostly for fun in a guitar trio with Riam Gradle and Nala Caliente. Men like Nina, and Nina likes men. She has three kids with three different men, she had never been married, closest she had ever gotten was an engagement with Dave Ramsay, father of her oldest daughter Rosie. Recently Nina has taken stargazing as a hobby and had collected some space rocks around town. She had also had a hot summer fling with the famous fencer Aegon Targeryen. You can read more about Nina here. Born Frederic Junior Hoves is one of the leading forensic scientist, not only in his town but the whole SimWorld. He solves cases from as far as Twinbrook. It’s no surprise to anyone really since Junior (a name by which he is best known) comes from a family of police officers. His father was an employee of the SVPD, his step-mother was a decorated special agent, his uncle is also a decorated police hero, and up until her recent retirement even his younger sister was a cop. Junior also has a wife and four kids. He and Hannah had been together since high school. Before Hannah he had two relationships, one with Bebe Hart and Alyssa Prentiss, Hannah’s older sister but since he started dating Hannah he doesn’t have eyes for anyone else. Junior loves to keep himself physically fit, he also likes painting, something he is not so good at. You can read more about Junior here. Hannah Hoves was born in a large family. She has two brothers, and an older sister. Junior, her husband, was her first love, and also her ticket to a better life after she was left taking care of her father who managed to alienate everyone else from him. Back when she was still living with her father Hannah earned money fishing, it is one of her favorite hobbies. But her dream was always to be a doctor, like her brother Andrew or best friend Pegasus Santoro but her dream was never realized since she had four kids to take care of. You can read more about Hannah here. Now he lives with his childhood best friend Cocoa Javeed and plans his retirement… Although he spent his life in science and medicine Andrew views himself as a creative soul and wants to learn to play an instrument now that he has time for himself again.He is engaged to a younger man named Patrick Crane. You can read Andew’s story here. Born Cocoa Brown, she came to town with her mother Ebony. They were the first inhabitants of Sunset Valley. Ever since her first trip to the art gallery Cocoa knew she never wanted anything other then be an artist. Her first love had been Tomas Prentiss, the boy next door, the brother of her best friend Andrew. However their love was never realized and in the end she married Skip Javeed. She had problems with having children, but when she finally gave birth it was to two twin girls Domynika and Sabina. However her husband died shortly after leaving her all alone to provide for her girls. This made Cocoa pause her art work and get an actual job for the town’s paper. You can read Cocoa’s story here. All posts in which Jill appears can be found here. Tomas Prentiss had recently left teaching to return to his dream job, science. He is working at the Landgraab Science Facilities on a project with Phoibe Santoro. He has four kids and another set of twins on the way. He is happily married to Rita Brown. You can read more about Tomas here. Rhaenys Targeryen is a mystery to most people, including her husband Harry. She has three children, two with Harry, a boy and a girl and one son from a previous relationship to the famous athlete Aegon Targeryen. She and Harry married in Harry’s garden shortly after the birth of their son Aenar. She had spent most of her life working in science but after she had been transferred to the army to work on a top secret project she had enough. Her aspiration is to do good in the world and she doesn’t think developing new weapons is a way to do that. Recently she had decided to go into politics. You can read more about Rhaenys here, Rhaenys first appears in the story in this post. Although Rita’s dream was always to go to space she somehow ended up still working at the same spa job she had ever since she was a teenager. But Rita also has a loving sweet husband, four lovely girls and another set of twins on the way. You can read more about Rita here. To Krystal nothing matters more then her family. And she would stop and nothing to make sure they are all happy and content, especially after her father Jesse’s death. She was very close to her father and misses him dearly. Sh loves reading books. She spends most of her time either in her bedroom or doing chores around her house, all in her underwear. She is a Simlish teacher at the local high school. Krystal is also gay and in a relationship with a local journalist but she keeps that a secret from everyone. You can read more about Krystal here. Dougie Hoves is recently married and still recovering from the loss of his mother Blair. He is not a very serious person, or someone suited for hard work. Dougie prefers playing music, dabbling with stuff in the garage, playing video games or partying with his best friend Luther. Now that he has a kid on the way he had settled for a new job, inventing. You can read more about Dougie’s life before he got married here. And about his life afterwards here. You can read more about Lysa’s life before she got married here and after she got married here. Harry Prentiss loves painting but he also loves his family, his beautiful wife Rhaenys, his lovely two children Aenar and Vaela and his little brother Hazel. Harry would stop at nothing to protect them. Harry is a self-employed painter who sells his works online, being self-employed he spends a lot of time at home with his kids. He is sad that very soon both of them will be in school but then again that would give him just more time to dedicate to his work… Harry also enjoys meditation and sleeping. You can read more about Harry here. However recently he had married his high school sweetheart Donnie Alto. He still lives in his childhood home with his brother Harry and Harry’s family. He hopes he and Donnie would soon start a family of their own. You can read more about Hazel here. Donovan Alto had chickened out the first time he was supposed to marry Hazel but he regretted the decision. He and Hazel are now happily married and Donovan runs a daycare from their home. He enjoys painting in his free time. You can read more about Donovan here, he becomes a family member when he marries Hazel in this chapter. Bradley Frail is determined to provide for his wife and son. That is how he got in a terrible mess that is Susannah Ramsay’s crime organization. He currently works as her getaway driver and he keeps it a secret from his family. He likes jogging. You can read all about Bradley here. Laquita Hoves prefers to be called Lucky, a nickname she had since childhood. She is determined to be the next Leader of The Free World from Sunset Valley like her role model Dina Caliente. Her next goal is to run for the City Council. She is in a relationship with Ahmed Kerry, son of her boss Posie. You can read more about Lucky here. Summer Caliente believes hard work can make all your dreams come true. She is the second child Dina and Nala Caliente adopted. She was raised in wealth and luxury but that didn’t make her lazy, quite the opposite Summer wants to achieve all her mothers have achieved and more. She lives in a house belonging to her mother Nala before her death with her husband Bradley and child Silvester. As a mother Summer is very strict and determined to pour all her values into her little boy’s head. She has completed one of her ambitions when she became a partner in the spa she had worked in since high school. You can read all about Summer here. Eevee lives alone after leaving her parents in an attempt to hide her new job at a criminal organization. Eevee had planned it to be just a way to gather information which she would turn in to the police and prove to her parents, especially her mother Mya that she could be a good policewoman, like most of her mother’s side of the family. Eevee has a twin sister, Martha “Marty” Gradle. She was in love with her mentor Mortimer Goth but their romance never kindled. Eevee likes movies and mystery novels, she also enjoys meditation and cares a lot about saving the planet. Born Ezekiel Mayor Zeke is the only son of Jill Mayor and Jesse Hoves. He doesn’t really like his job at the City Hall but is too scared to quit because he doesn’t know what do after it and he doesn’t want to anger his best friend and sister Lucky. He is engaged to Marty Gradle and hopes he would soon be able to give her a wedding that she dreams of. Zeke likes music and his latest hobby is cooking, something he could never try while living with his sister Krystal. You can read more about Zeke’s life here but Zeke also appears in here. Being a daughter of two famous and very accomplished musicians, the famous composer Nina Caliente and rock star Riam Gradle, Latiricia found herself having no choice but to go into music herself. She had finished her studies at the Sim City Music Conservatory and came back to Sunset Valley where she lives in a beautiful new house her mother bought. While studying her high school boyfriend Mikha’il Kerry proposed but but rejected him. In search of spirituality she spent a summer in a temple and when she came back to school she found out Mikha’il had dropped out and went back home. Once her house had been broken into she ran into Mikha’il again, at the police station. 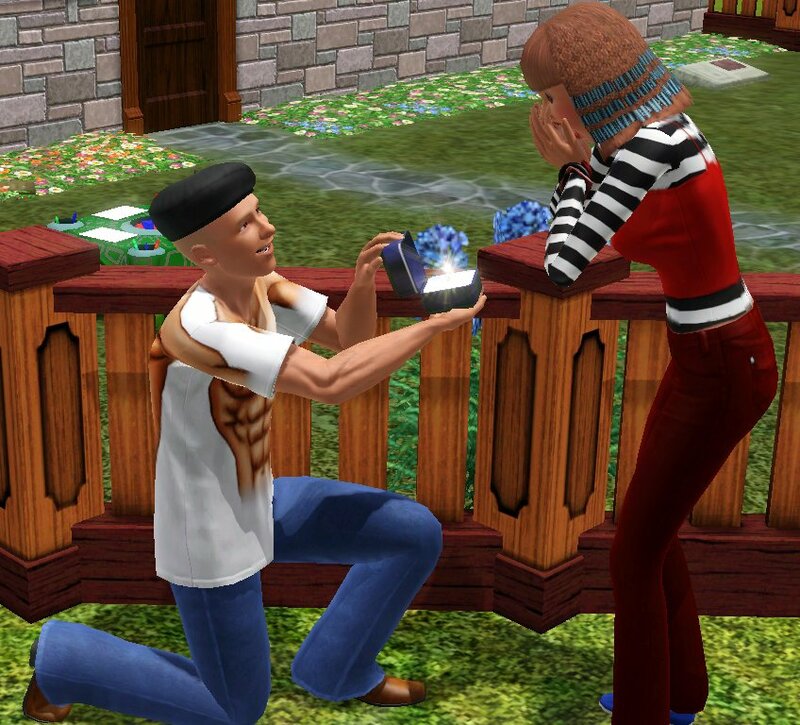 All feeling steered again and this time it was Latricia who proposed and Miha’il who said yes. She was really shaken up when her sister Rosie attempted suicide since she was always closed to her, but not as close as she is to her little brother Bran. You can read more about Latricia here and here. After the recent unpleasant happenings in their usually quit town, happenings that resulted in the death of her half-brother’s father Vanessa had decided she wants a career in law enforcement. She is currently studying forensics at the University. Vanessa’s story starts here (with her time spent living with Jesse), she makes an appearance in Nala’s story, in the first few posts found here before she finally gets her own story which is ongoing here. You can read more about Irene here. Eduard thinks himself really lucky to have a girlfriend like Sabina. She is the most popular girl in school while he is a nerd in both the chess and computer club. But Sabina doesn’t care about any of that, in fact she is even learning chess so they can play together. You can read Eduard’s story here. Lena loves to paint and write. Her painting days started when she got a painting easel as a gift for her fifth birthday, she started writing after taking a course when she was a child. As a teenager she now gives courses to other, younger children. Lena’s also taking guitar classes. Her biggest problem is learning to drive, something her sister Nan can’t let her forget.She is dating Brenton Frail and hopes to travel the world with him when they both graduate high school. You can read more about Lena here. While her twin Lena is artistic Maja has a more rational, scientific mind.She still hadn’t decided whether she would go on and study science like her father, or medicine, whatever she chooses she wants to be the best at it. Maja’s hobbies include experiments and pranks, but she doesn’t mean bad, she just wants to observe and record people’s reactions. Maja is recovering from a heartbreak, her crush Jacob chosing her cousin Domynika over her. You can read more about Maja here. You can read more about Frederica here. Sabina sometimes have troubles with finding a line between reality and fantasy… In her head sometimes she is a princess that lives in a beautiful castle and sometimes she is just a normal teenager going to school… In school she is very popular, everyone likes her. Especially her boyfriend Eduard who always brings her the pretty yellow flowers she likes so much…. You can read Sabina’s story here. Domynika likes the dark and the morbid. She also likes the stars and exploring the universe. She is very confident and has a little mean streak. She did steal her friend’s date right under her nose… She is an active participant of the town chess tournament. You can read Domynika’s story here. Delores, or Della how most people call her, is a quiet girl who mostly keeps to herself. She likes helping people, at home she does most of the household chores, and at school she is the founder of the Study Club which serves the purpose of tutoring and helping students with their homework and assignments. She is currently dating Lacey Alto. You can read more about Della here. Nan is nothing like her twin sister Della. She likes to tournament everyone she encounters, especially her older sisters Lena and Maja. Nan doesn’t really have friends apart from her twin. However recently Nan had found herself an object of attention of two teenage boys, Bran Caliente and Aenys Targeryen. Nan really enjoys her current situation and hopes to be able to get the best of it. You can read more about Nan here. Kerry Hoves has a nice family, good friends… All that is troubling him is his girlfriend Tami… With her mood swings and sudden jealousy outbursts why are people surprised he had flirted with Marcia Minton at his party? Why is Lena Prentiss snubbing him? You can read more about Kerry here. You can read more about Bran here. Ty Hoves dreams of being more like his older brother Kerry. Ty loves books and he prefers chatting with people online. You can read more about Ty here. Aenar Prentiss is a good and friendly child. He is happy in school and has two friends there, Silvester Caliente-Frail and Melissa Gradle. You can read more about Aenar here. You can read all about Silvester here. The youngest child of Junior and Hannah Hoves looks a lot like her older sister Freddie. Not many people realize she might bit a lot like Freddie in other ways as well.. Haley hangs out with her younger cousin Vaela but her best friend is Maegon Targeryen. You can read more about Haley here. Vaela loves bunnies. She has a bunch of stuffed, pink bunny toys. She would be starting school soon and her mother wanted her to befriend her cousin Haley so she would have some friends there, other then her big brother Aenar. You can read more about Vaela here. Dalma Prentiss is the newborn daughter of Rita and Tomas Pretniss. She has four older sisters and a twin named Tracy. Dalma hadn’t appeared in her family’s official story yet (that story can be found here). She has only one brief appearance in Back to school. Tracy Prentiss is the newborn daughter of Rita and Tomas Pretniss. She has four older sisters and a twin named Dalma. Tracy hadn’t appeared in her family’s official story yet (that story can be found here). Ebony Brown was the first sim to move in to Sunset Valley. She arrived with her toddler daughter Cocoa and got her first job at the spa. After a few years she befriended Dina Caliente who became her mentor and she went into politics. She retired as mayor of Sunset Valley. She was married only once, to Harald Prentiss, briefly. She had four children, Cocoa, Rita, Harry and Hazel and she lived to meet her four granddaughters, Lena, Maja, Sabina and Domynika. She died after an illness living with her two youngest sons. Born Nadine Fong she was the woman who kept up with Jesse the longest, long enough to give him two daughters, Laquita and Irene which is why in the end Jesse chose to marry her. Before marrying him she worked as a bartender in a dance club in Sunset Valley. At the time of her death she was employeed at the army base as a cleaning lady. Her life dream, one she never completed was to be a renowned pianist. Blair (nee Wainwright) Hoves came into town when she moved in with her boyfriend Freddie. The couple eventually got married and had one son, Douglas. Blair worked as a special agent on many missions throughout the sim world, she liked video games and butterflies. After retiring from police work she worked as a Fire Captain and save many lives. She died after at the hospital after fainting on Dina Caliente’s bachelorette party. Nala Caliente, born Nala Sanza, had two great loves in her life, her wife Dina and her music. Eventually she divorced Dina but her music remained with her until the day she died. She was a famous composer and had a chair in the Sunset Valley’s symphony. She and Dina adopted two daughters, Sara and Summer and at the time of her death Nala had one grandson she was very close too, Silvester. Jesse Hoves moved to town with his brother Freddie and Freddie’s two children. Like Freddie he joined the police force soon after arriving to town. Jesse worked for the SVPD his whole life. He was killed in a police raid by a criminal Susannah Ramsay. Jesse was kow in town by his many relationships. He was married only once, to Nadine Fong, the two of them had two children but Jesse had other children, with other women. At the time of his death he had five children: Rita, Krystal, Laquita, Zeke and Irene and four grandchildren, Lena, Maja, Delores and Nandini.